Many travellers associate the island with wild parties and package holidays for young tourists hell bent on having a good time, but Mallorca's quieter resorts are fantastic places for families with children to take a summer holiday, and the combination of great tourist amenities and historic sightseeing will keep everybody entertained and happy. Puerto Pollensa and Cala d'Or are quiet and the beaches uncrowded, a great location for the kids to build sand castles and play with buckets and spades, but remember to pack the sunscreen as the temperatures in summer months can be searing. El Arenal boasts an enormous waterpark, as do Alcudia and Magalluf - what could be a more perfect day out for the kids? Take the kids go-karting in Magalluf, or enjoy a family horse-riding trip to see the island from Alcudia. 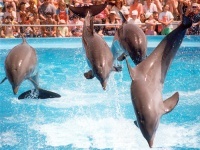 A trip to Marineland, in Costa d'en Blanes, to watch the dolphins and sea lions perform, or be mesmerised by the sharks in the aquarium, is a must. On days when outdoor activities are not an option for kids on holiday in Mallorca, many of the hotels feature kids clubs, or children's indoor playgrounds, and there are other options such as Mallorca Aquarium in Porto Cristo. Of course, the city of Palma has many attractions for a rainy day, but those wanting to stick to their chosen resort certainly shouldn't be bored either. We are looking for contributors for our Mallorca travel guide. If you are a local, a regular traveller to Mallorca or a travel professional with time to contribute and answer occasional forum questions, please contact us.